We provide popular fabrication services. You'll be amazed at the number of items that can be made out of moulded and shaped acrylic, and how versatile and hard-wearing the material is. We're experts in the design and fabrication of acrylic sheet and block, and we only use the latest state-of-the-art equipment. Our highly skilled plastic fabricators are experienced enough to complete every project, however complicated, to the highest level of quality. 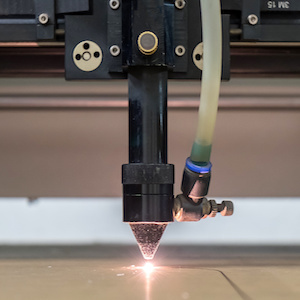 We carry out fabrication using laser cutters, CNC machining, heat bending, heat forming, diamond polishing, flame polishing, solvent bonding and even ultrasonic welding. It means we can fabricate more or less anything you like, from simple panels to incredibly complex pieces of artwork, all using the top quality raw materials we insist upon. Line bending applications tend to be those with single or double parallel bends, frequently used to create point of sale material and furniture, and capable of producing some surprisingly complex forms. We rely on our brilliant CR Clarke Heaters instead of hot air ovens, since they're faster and easier to use. Line bending is great for making one or more tight radius bends in sheet plastic, and we control the radius of the sharp bend by adjusting the width of the heated area. The main benefits of line bending are the fact that straight bends are easy to make, the machine set up costs are low, and there's no tooling required. Acrylic can also be thermoformed in specialist ovens. They let us make large, impressive pieces that would be impossible to achieve any other way. We heat the acrylic sheet to its forming temperature then place it over a mould to make an airtight seal. The machine draws a vacuum through the mould, pulling the sheet towards it. The part takes the shape of the mould, is slowly cooled, then released. Our oven is a forced circulating-air oven, which heats consistently and evenly thanks to a thermostatic control. Because acrylic sheet has a low molecular weight we can't hang it from one edge. Instead we use a special clamping frame for support, which means you get excellent quality finished products. Get in touch to discuss your fabrication needs. Acrylic fabrication comes with so many advantages. It means we can easily create completely unique, wholly customised pieces for almost any purpose. If you have a project in mind and want to talk things through with an expert, we're always happy to help. The process is fast, efficient and effective, and the results are stunning! Contact us with any questions.